In a recent survey conducted by *Clutch.co, 300+ businesses across the US were polled about their experiences using live answering service providers (automated answering and voicemail systems were included). The survey measured businesses’ attitudes and behaviors toward answering services. Its results distinguish VoiceNation as a leader and preferred partner for businesses nationwide leveraging live answering services. FACT: VoiceNation has served more than 100,000 business customers since 2002. VoiceNation live operators do more than just answer your phones and deliver messages. From gathering information and vetting prospects to assisting customers with orders, count on our dedicated team of operators to help you increase your company's bottom line. FACT: We take 4.5 million calls annually...and each one is as important as the next. Businesses need to collaborate with remote employees and VoiceNation can be that unifying force. Our live, virtual receptionists can serve as your single point of contact, and transfer important calls to employees whenever they want-wherever they are. LISA CALHOUN, PRESIDENT, WRITE2MARKET, INC.
With the plethora of choices available to consumers today, its critical for businesses to stay connected to their customers. VoiceNation's live support gives you a competitive edge - and with 24/7/365 staffing, you'll never miss an important call or message again. These are the Oscars of live answering. 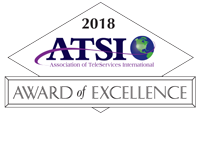 And we’ve received ATSI’s honor for two years running. Independent judges are contracted by ATSI to evaluate VoiceNation’s message services over a six month period. The criteria for scoring include: the caller experience, courtesy, response time, accuracy and overall service to their clients. Clutch.co conducts ongoing reviews live answering services based on actual customer testimonials and its own diligent research. And VoiceNation always bubbles up to the top of Clutch’s rankings. And this past year, VoiceNation won Clutch awards in four different categories: virtual reception, order processing, customer support, and overall live answering. Whether we’re providing meals to families whose children go hungry between school lunches, working hand-in-hand with the Georgia Alliance to End Homelessness, or confronting the issue of bullying head-on, VoiceNation understands its responsibility to the place we call home. 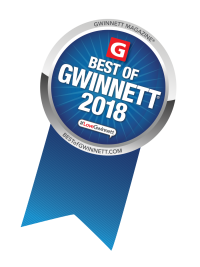 Our actions in suburban Atlanta has earned us recognition as a “Best of Gwinnett” business time and again. 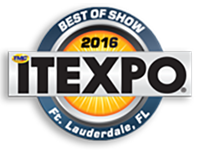 The IT EXPO Best in Show Awards program recognizes companies demonstrating creative and technologically innovative solutions or services. At the heart of VoiceNation’s live answering solution is its open-source self-developed call center software, OpenAnswer, which was recently recognized as the best customer service solution in its class.